My daughters crave my attention. They crave to be a part of every waking minute of my life. They want to participate in everything I do, even especially if it’s just a quick walk down to the basement to retrieve something. Even in my moments of downtime they come ready to showcase their latest accomplishments, newly discovered talents and anything they think will make me smile. These marvels are all paraded across my feet or placed in my lap in 2-minute increments accompanied by huge grins of satisfaction. Now be kind, I realize I bring it on myself. From their point of view I’m lying under the kitchen sink or looking for something under the hood of the car or hiding in the basement. They don’t know that I’m clearing a p-trap or changing an air filter or avoiding responsibility building a wood shelf because I’ve never explained any of those things to them. Maybe if I just included them in the things their daddy does they’d show interest in participating…? So I flipped the tables on them and started inviting my kids to participate in every little task and chore I had on my plate. “Your new loft bed arrived today. Can you help me put it together? Every time I asked they immediately responded in the affirmative. OK, so far so good. Now what? Most of the work I do largely falls into the buckets of things-dad-does-on-the-counter, things-dad-does-on-the-desk, and things-dad-does-under-the-hood. My kids exist at knee height, they’re elevation-challenged walking trip hazards. While I’m working they’re constantly underfoot AND squabbling over who got the better of the terrible vantage points. 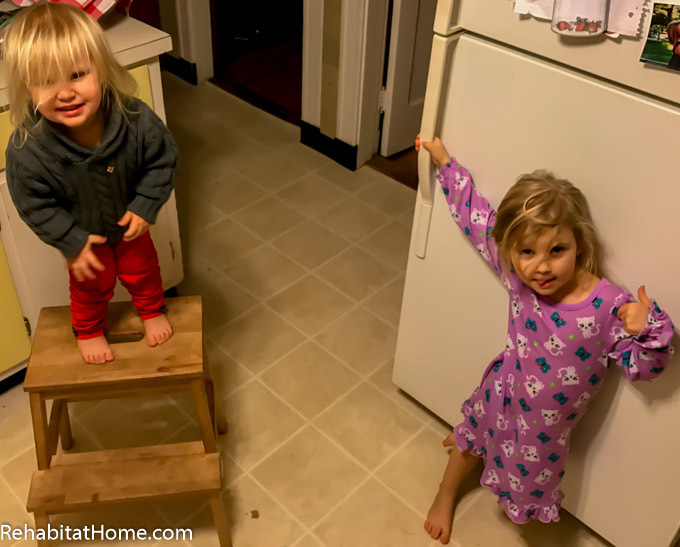 So I willingly introduced several *new* trip hazards into my life in the form of a learning tower towers, ladder and stool stool (not a typo, it lives in the spash-zone of my bathroom) to help. I use them constantly to provide my girls the means to actually see what’s going on “up there.” They make the inevitable nighttime meeting of shinbone and hardwood almost worth it. Once they were able to see what was actually taking place, their eyes and interest grew. Note: I personally own everything in the ad above and use them regularly to give my kids an appropriate vantage point. 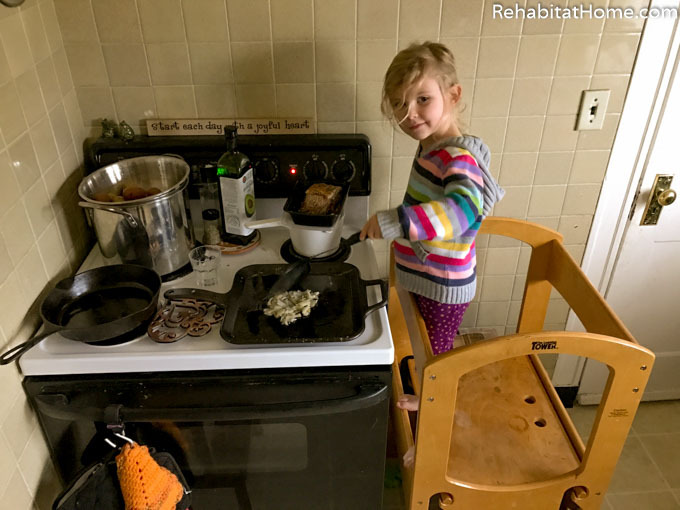 The learning tower lives in our kitchen and lets the girls watch me cut meat on the cutting board or caramelize onions in our cast iron skillet. 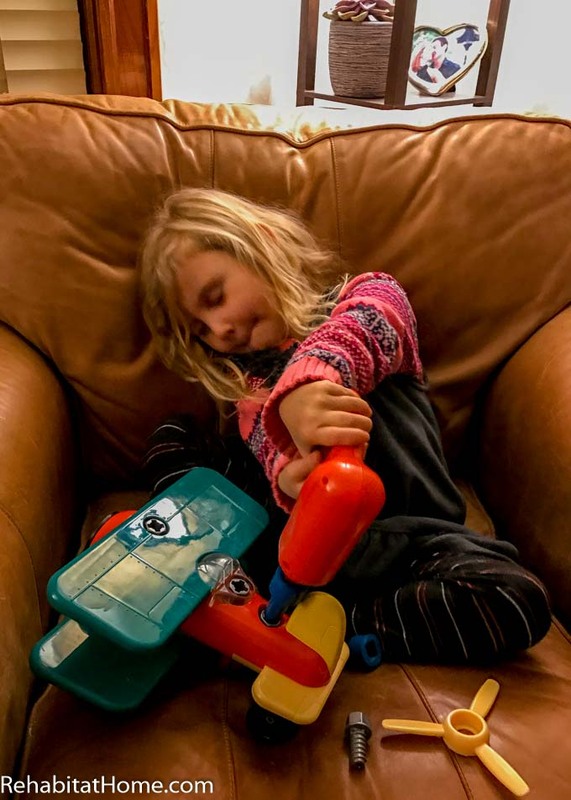 The three-step ladder is the perfect height for automotive jobs taking place under the hood; I set it up next to the driver’s tire and put my daughter in charge of the tools and parts I place in the tray. The little IKEA ladder is the primary culprit for scratches and scuffs in our hardwood floors because it gets dragged EVERYWHERE to turn on light switches, fetch books off shelves, get dad’s print-outs off the copier and they even eat at it like a little picnic table when we take snack breaks. The Rubbermaid stool is for getting on and off the toilet…it’s a stool, we covered this already. 4-year-olds are known to ask a lot of questions. Ours is no different. But we have found she asks fewer questions or investigates a situation differently the more details we voluntarily offer her. I actually made it a challenge to provide too MANY details, thinking I’d find a threshold between boring and interesting. Nope, I couldn’t over-inform my kids. They ate up every description of bolt materials and thread counts, gas boiler operation and safety, how and where our tools are made…I even went so far as to explain the role of every piece of hardware that came with a large piece of furniture. She didn’t flinch or bat an eye, just sat there riveted with ever growing fascination. In fact, the opposite happened. I rattled off all the correct terms in my explanations and she memorized them all. Now when I refer to a part or tool using a different name (drill, screw gun, electric screwdriver) I get a concerned look and I’m politely corrected. Which isn’t such a bad thing, I suppose. OK, so what’s going on here? I suppose that jobs that daddy and momma do around the house may look very complicated. It must seem like magic when dad adjusts the choke to get the lawnmower to start, replaces the thermocouple in the hot water heater or puts toys back together when they inevitably undergo an involuntary disassemble. But when they have every step explained in excruciating details it was almost a relief to them to hear the simplicity of our actions: we were just unscrewing this, replacing that, smearing that stuff there, twisting this a bit to the right, etc. And while little eyes are watching, it’s a great time to also engage little ears and minds by discussing everything you’re doing or about to do and why you’re going to do it. Upon further reflection it dawned on me that “complicate” adult tasks are just combinations of very basic tasks: consolidating, segregating/sorting, stacking, attaching, detaching/dissembling and various fine motor skills. Unfortunately, the only thing really keeping me from going completely hands-off and allowing my kids to do the work completely unassisted was their lack of practice. So my answer was to introduce toys which teach specific desirable behaviors. My girls already play with toys all day and I like what most of them teach. They already learn stacking with blocks, attaching with legos and disassembly whenever they find my TV remote. But they didn’t really have anything to teach them how to use actual tools. While we were out shopping at after Christmas we happened upon a couple of toys that I’ve never seen before but I’m excited that we found. The styrofoam Real Construction kit from Jakks is going to be our next distraction. The kit includes designs and modular “lumber” made of foam…they have to actually cut it out and assemble it themselves….from scratch…with actual screws! Bwahahahaha! The kit includes designs for multiple vehicles and refill kits can be purchased online (although I plan to use packing foam and a hot wire). 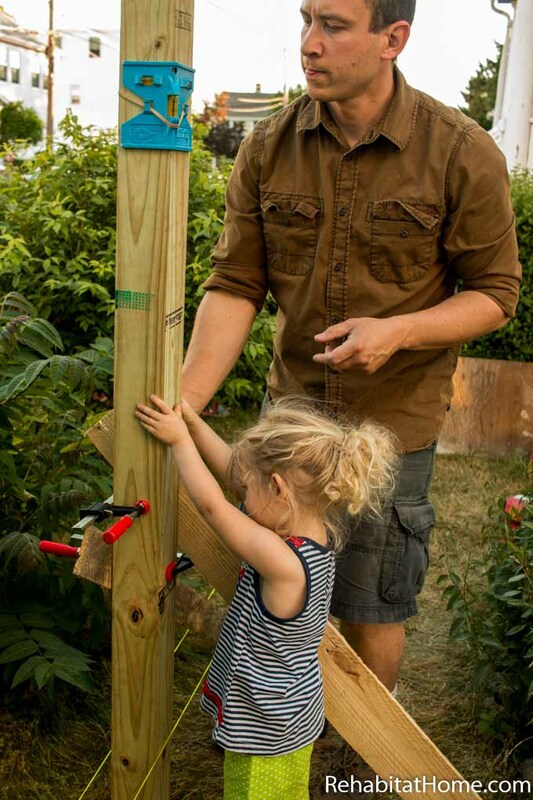 The biggest selling points are her learning to use a saw to make a straight cut, using a screwdriver to install a screw, how to measure and mark her workpieces and actually ending up with something she built from scratch. And once she’s a little bigger these skills will all translate directly into the workshop. My girls now demand to be a larger part of everything we do as a family, they want to participate! They get excited whenever I walk out of the room in hopes that I’m about to embark on some new adventure that they’ll get to help me with. Their desire to participate allows me to delegate smaller, age-appropriate tasks to them with the full confidence that they’ll be completed. 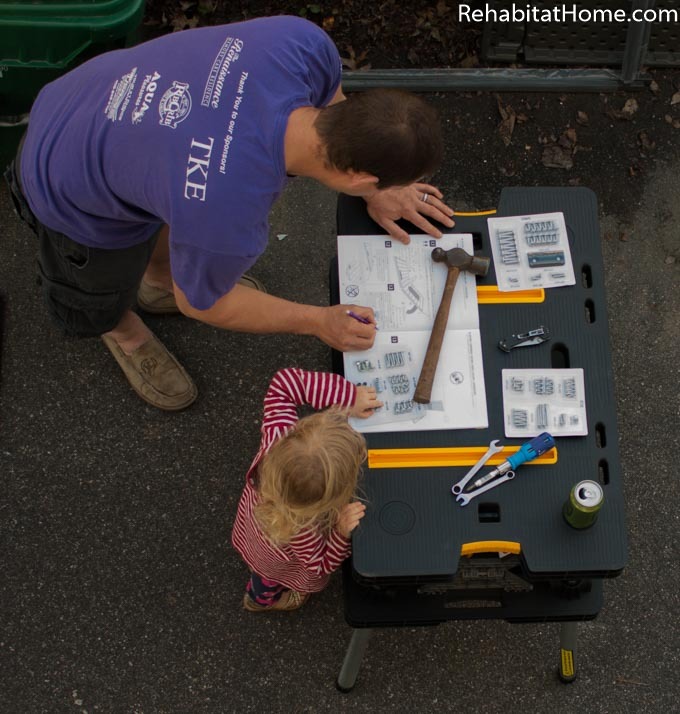 It may not seem like much but having a helper that can gather a list of tools, stir food to keep it from burning, rake up a section of leaves into a pile and finish screwing in a bolt while dad looks at the instructions…can be a big help! 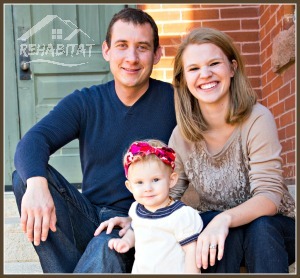 Seeing the finished product really does something for a small child that helped complete it. “If I can do this, I can do other things I thought I couldn’t.” My older daughter no longer cries to get us to turn on the light switch, she now confidently strides grabs my wife’s boot and uses it to move the light switch. She no longer begs to be fed, she asks to help cook. She no longer needs us to dress her, now she helps her sister get ready. 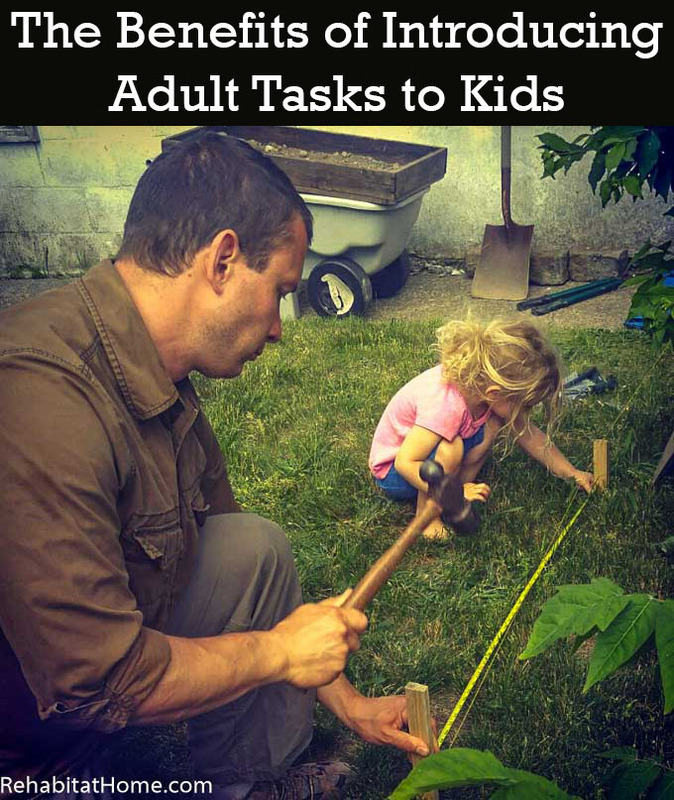 What adult tasks have your little ones been introduced to at your house?